John Perceval, 1st Earl of Egmont (1683-1748), President of the Trustees of Georgia. Sitter in 8 portraits. John Smith (1652-1743), Engraver. Artist associated with 1180 portraits, Sitter in 4 portraits. James II's son, James Stuart, mounts an unsuccessful invasion of Scotland with a French fleet, endeavouring to reclaim the throne. 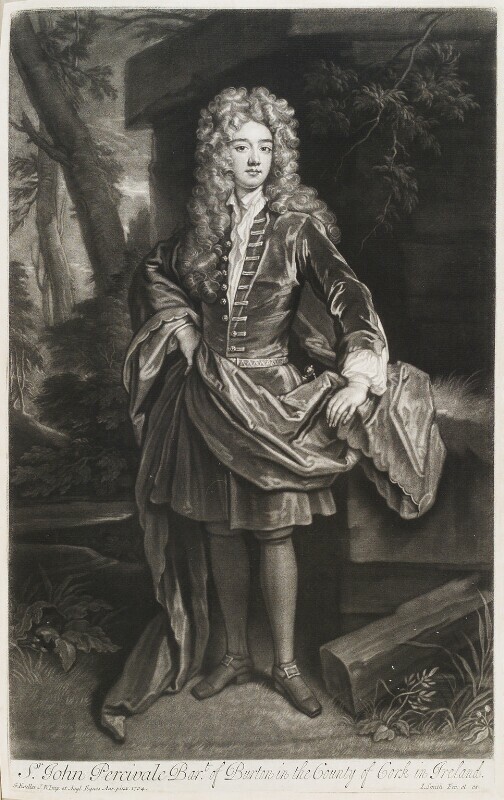 Robert Harley, Duke of Oxford, having intrigued against the Duke of Marlborough and Earl of Godolphin, is dismissed from Parliament by Queen Anne. Queen's consort, Prince George of Denmark dies. The overall construction of St. Paul's Cathedral is completed. Sir Christopher Wren's son and the Master Mason lay the last stone on the lantern in a 'topping out' ceremony. The allies' decisive victory against the French at the Battle of Oudenarde is principally due to William Cadogan, Earl of Cadogan's skilful deployment of an advance guard at opening stages of battle. Minorca is captured from Spain by the Anglo-Dutch navy.